Analysis of Potential Health and Environmental Impacts of Chemicals in Dispersant Products. The report, The Chaos Of Clean-Up, was prepared by Toxipedia Consulting Services and Earthjustice. The report was funded by the Gulf Restoration Network and Florida Wildlife Federation. Following the Deepwater Horizon oil spill, chemical oil dispersants were applied in unprecedented amounts both at the ocean’s surface and underwater at the well head. 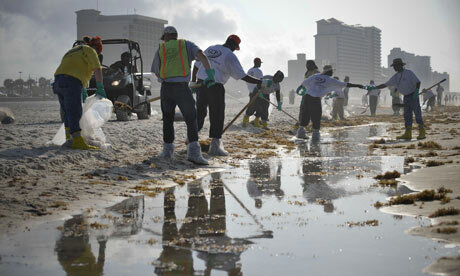 The report, The Chaos Of Clean-Up, was prepared in response to widespread public concern among Gulf Coast communities about the safety of chemicals, known as dispersants, that were poured into the Gulf of Mexico to disperse oil during the Deepwater Horizon disaster. This report presents findings from a literature review of scientific research on each of 57 chemical ingredients that are found in dispersants that were eligible for use at the time of the Deepwater Horizon disaster. The ingredients and formulas for various dispersants on the market typically are not available, and it is not fully known which chemical ingredients among the 57 are found in which dispersant. Clearly, some of the chemical ingredients are more toxic than others, and some dispersants are more toxic in particular environments. The widely-varying toxicity of different dispersants underscores the importance of full disclosure and proper selection of dispersants for use in oil spill response. While revealing some of the potential hazards of dispersants, the literature review also highlights the extent of our current lack of knowledge about dispersants and their impacts. Ultimately, the absence of thorough scientific research on dispersants and the chemicals that comprise dispersants, as well as the lack of public disclosure of each dispersant’s ingredients and formulation, hinders any effort to understand the full impacts of dispersant use. These findings call for more research, greater disclosure of the information that is known, comprehensive toxicity testing, the establishment of safety criteria for dispersants, and careful selection of the least toxic dispersants for application in oil spill response.